BLANDING, Utah — U.S. Interior Secretary Ryan Zinke took an aerial tour Monday of one of America’s newest and most hotly contested monuments — one of 27 he’s been ordered to review by President Donald Trump to determine if they were properly established. Zinke’s tour guide for the helicopter ride over the 1.3-million acre (5,300 square kilometers) swath of southern Utah with red rock plateaus, cliffs and canyons was Gov. Gary Herbert, one of several prominent Republican leaders in the state who oppose Bears Ears National Monument. Herbert, U.S. Sen. Orrin Hatch and the rest of the all-GOP congressional delegation consider the monument creation by former President Barack Obama an unnecessary layer of federal control that will hurt local economies by closing the area to new energy development. They also say it isn’t the best way to protect the land. “The only way to truly learn about and understand a place is with boots on the ground,” Zinke posted to Twitter after landing in Blanding for the second day of his four-day trip to see Bears Ears and the Grand Staircase-Escalante. 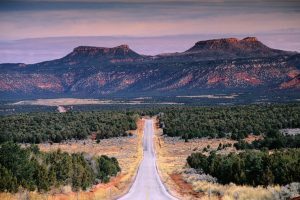 Zinke and Herbert were expected to hold a news conference later in the day before taking a hike to one of the ancient ruins within the Bears Ears site. The monument review is rooted in the belief of Trump and other critics that a law signed by President Theodore Roosevelt allowing presidents to declare monuments has been improperly used to protect wide expanses of lands instead of places with particular historical or archaeological value. Conservation groups contend that the monument review puts in limbo protections on areas that are home to ancient cliff dwellings, towering Sequoias, deep canyons and ocean habitats where seals, whales and sea turtles roam. In Blanding, with a population of 3,400 people, two large banners read, “#RescindBearsEars,” reflecting the popular sentiment among residents. Those who want Zinke to leave Bears Ears alone to preserve lands considered sacred by tribes made their voices heard, too. Tara Benally, a member of Navajo Nation, was standing just outside the Blanding airport wearing a shirt commemorating the December declaration of Bears Ears National Monument. He insisted there is no predetermined outcome of his review, saying he may not recommend the monuments be made smaller or rescinded, and he might even recommend an addition. Zinke has been tasked with making a recommendation on the Bears Ears monument by June 10, about 2½ months before a final report about all the monuments. The two monuments he’s reviewing in Utah are quite large. Created in 1996, Grand Staircase-Escalante is 1.9 million acres (7,700 square kilometers), about the size of Delaware. Bears Ears is a bit smaller at 1.3 million acres. Environmental groups have vowed to file lawsuits if Trump attempts to rescind monuments — a move that would be unprecedented. On Tuesday, Zinke plans to tour the Bears Ears area on horseback. 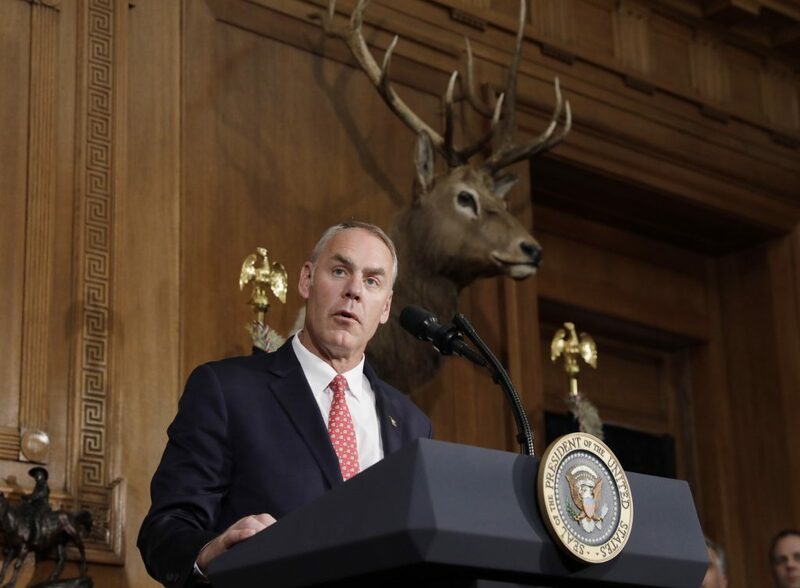 “I think, sometimes, the best way to see things is slow and easy with a horse,” Zinke said, referring to his commute ride through the streets of Washington, D.C., on his first day as Interior secretary.